Design Your Life With a Lil Sparkle and Creativity, what fun! What a week! It's summer time, holiday, and I have to say it . . . I just feel lazy lately! I took a last minute week off from things a bit. Oh, yeah. With my shops, organizing at home, crafts, and I mostly lounged. But, I did take one day to myself to visit our local thrift store in town, and another one over yonder as well. Both stores have things donated to them, but what a difference in some of the inventory and the prices too! Not to mention the hospitable service between the two also. 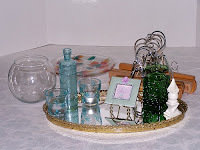 I visited with Melissa's Hope Chest where I found the gorgeous heavy glass vase with some wonderful design in it. 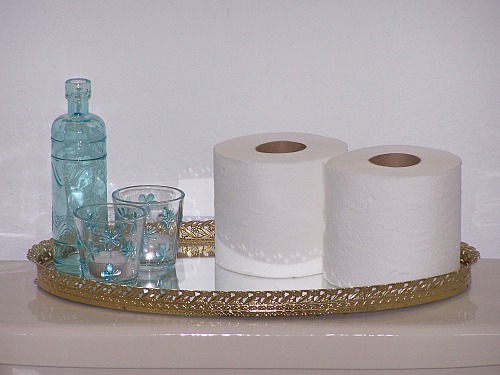 I also found the gold filigree vanity dresser frame tray there too. 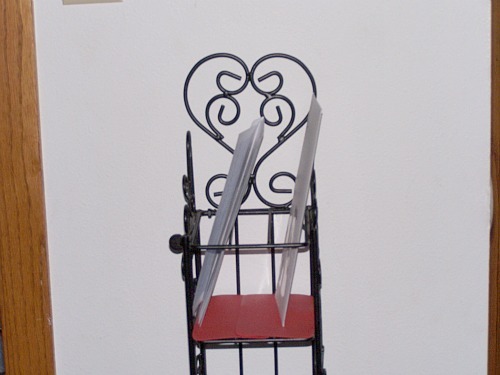 Oh, yes, I can't forget those wonderful vintage hangers that are fun to work with too! Some day I will have to show what I have been working for with those. On my way home I stopped with our local thrift shop which does not happen often. I don't agree with their ethics there of how the employees take for themselves what comes through the door for donation, or they set things aside for close family members, and friends. The day I visited I watched a very expensive horse saddle brought ought for a customer. One of them good saddles that would cost about $1100+. I watched them bring it to the counter for this girl who then paid only $30 for it. Wow! 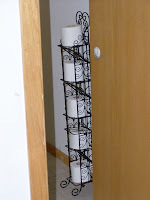 Anyway, that is where I found the black scroll stand or wall hanging. I also got the blue glass jar with the glass votive holders. 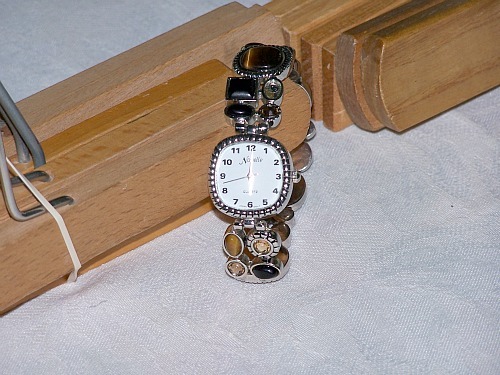 I found the brown beaded watch there which is missing a bead, and needs a battery. But, it is something I can deal with to fix too. 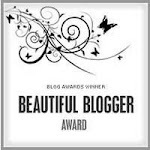 I got the cute little picture frame with stand to set on my vintage vanity in our bedroom, and the white stand is holding a picture of my grand daughter on my desk as I write this to all of you. 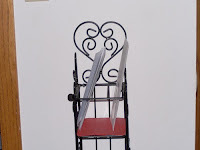 As you can see from the pictures I was undecided with the black scroll stand. 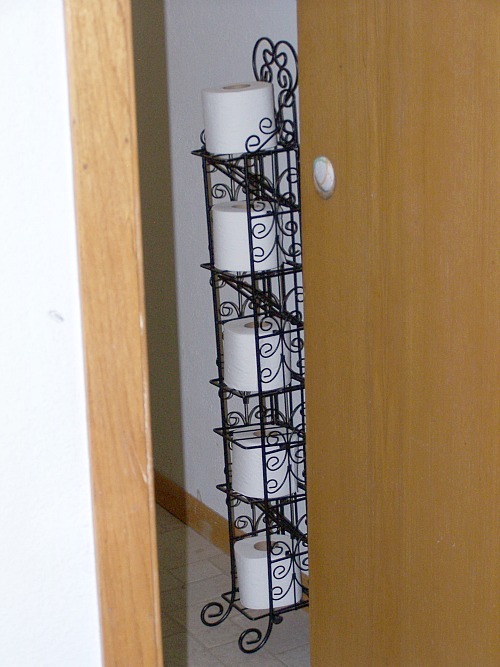 Our downstairs bathroom is small, and I wanted something there to hold some rolls of toilet paper for us. I really don't have enough room to hang things on the wall, and was hoping this would work. It did at first, but I wasn't settled with it yet either. So, I then moved the stand into my office, and set it against the small wall with our clock above it. As I looked at it I was thinking of course. I then put something solid on the second shelf as you can see, and I am using the slots above to separate most of the mail that comes. Below it on a couple of the shelves I have put in small boxes of envelopes which fit in there good. So, it is working well in my office at this time....till I change my mind again. You will also see that I did compromise for the bathroom an idea. I used the gold filigree tray to set a couple rolls of toilet paper on those, and on the side I decorated with the blue glass bottle, and the 2 votive candle holders. By the way, the 2 votive holders have tea lights in them that have a blue wick too. This all goes very well with our shower curtain that has a very light designs of vintage paper, vintage bathroom bottles, few butterflies, with colors of sand, blue, purple, and a beachy green color. So, sometimes it is great to thrift shop for your business, crafting, and the things we do online or in our own stores. 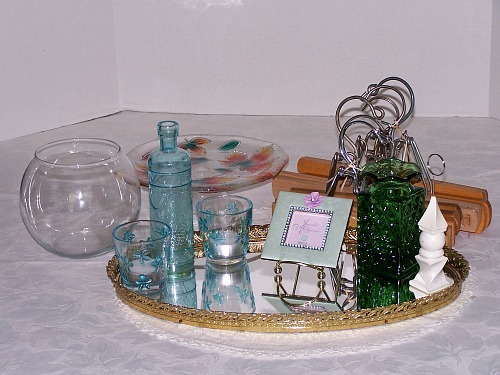 Yet, it is so much fun to thrift, and be able to create different things for our own homes too. Don't you think? Hey, doesn't hurt to add a little sparkle, and creativity to our homes, right? Hope you all had fun visiting today, and maybe got a few ideas of things to do for yourselves. 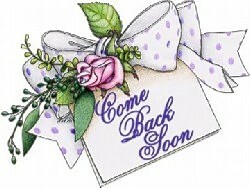 Remember you are always welcome to share some thoughts, and ideas with all of us here as well. 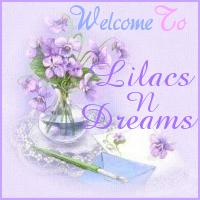 Thanks for visiting with LilacsNDreams, and hope to see you all again soon. Have a sweet day everyone!